Today I awoke to discover that one of my personal heroes had passed away. 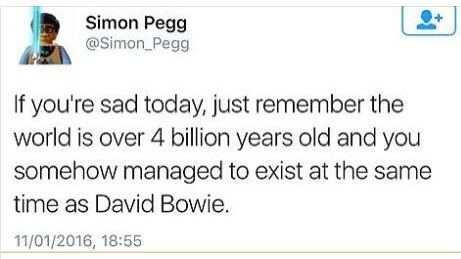 In a world where the term is thrown around too easily, David Bowie was a genuine creative genius. His ability to recreate himself and his efforts to recreate this world were the true hallmarks of this graceful, kind, intelligent man. He worked tirelessly to create opportunities for thousands of younger musical and contemporary fine artists through his ground breaking BowieArt initiative. I was lucky enough to see him play. Luckier yet that on the night I did, he threw out his prepared set list and instead had what amounted to a 2 hour jam session with the band. Playing tracks he wanted to do and taking requests from the audience. Several times he had to grab an instrument from one of the players to show them a part of a song so they could play it. It was a magical, yet really humanising experience. 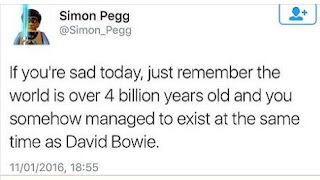 Now the man who fell to earth has gone back to the stars, and we are much poorer without him. I wish him all the best wherever he may be. Well said, I can only echo your comments and agree we've lost a true icon.